How Orientalism Created the Charade of ‘Benevolent’ Imperialism? It’s an incontrovertible fact that the British colonizers built roads and railways in India, they established missionary schools, colleges and universities, they enforced the English common law, and the goal of exploiting the natural resources and four-hundred-million-strong Indian manpower, at the time of independence in 1947, and trading raw materials for pennies and exporting finished goods with huge profits to the Indian consumer market never crossed the “altruistic minds” of the British imperialists. Puns aside, there is an essential precondition in the European Union’s charter of union, according to which the developing economies of Europe that joined the EU allowed free movement of goods (free trade) only on the reciprocal condition that the developed countries would allow the free movement of labor. What’s obvious in this stipulation is the fact that the free movement of goods, services and capital only benefits the countries that have a strong manufacturing base, and the free movement of workers only favors the developing economies where labor is cheap. 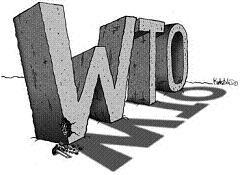 Now, when international financial institutions, like the IMF and WTO, promote free trade by exhorting the developing countries all over the world to reduce tariffs and subsidies without the reciprocal free movement of labor, whose interests do such institutions try to protect? Obviously, they try to protect the interests of their largest donors by shares, the developed nations. Some market fundamentalists, who irrationally believe in the laissez-faire capitalism, try to justify this unfair practice by positing Schumpeter’s theory of “Creative Destruction”: that the free trade between unequal trading partners leads to the destruction of host country’s existing economic order and a subsequent reconfiguration gives rise to a better economic order. Whenever one comes up with gross absurdities of such proportions, they should always make it contingent on the principle of reciprocity: that if free trade is beneficial for the nascent industrial base of developing economies, then the free movement of labor is equally beneficial for the workforce of developed countries. The policymakers of developing countries must not allow themselves to be hoodwinked by such deceptive arguments; instead, they should devise prudent national policies which suit the interests of their underprivileged masses. But the trouble is that the governments of the Third World countries are dependent on foreign investment, that’s why they cannot adopt independent economic and trade policies. The so-called multinational corporations based in the Western financial districts make profits from the consumer markets all over the world and pay a share of those profits to their respective governments as bribes in the form of taxes. A single, large multinational corporation based in the Wall Street and other financial districts of the Western world generates revenues to the tune of hundreds of billions of dollars, which is more than the total GDP of many developing economies. Examples of such behemoth business conglomerates include: Investment banks – JP Morgan, Goldman Sachs, Barclays, HSBC and BNP Paribas; Oil majors – Exxon Mobil, Chevron, British Petroleum, Royal Dutch Shell and Total; Manufacturers – Apple, Boeing and Lockheed Martin. Pakistan’s total GDP is $300 billion and with a population of 210 million, its per capita income amounts to a paltry $1600; similarly, India’s per capita income is also only $2000. Whereas the GDP of the US is $20 trillion and per capita income is well in excess of $60,000. Likewise, the per capita incomes of most countries in the Western Europe are also around $40,000. That’s a difference of more than twenty times between the incomes of the Third World countries and the beneficiaries of neocolonialism, North America and Western Europe. Only the defense budget of the Pentagon is $700 billion, which is more than twice the size of Pakistan’s total economy. Every balance of trade deficit due to the lack of strong manufacturing base makes the developing nations poorer, and every balance of trade surplus further adds to the already immense fortune of the developed world. Without this neocolonial system of exploitation, the whole edifice of supposedly “meritocratic” capitalism will fall flat on its face and the myth of individual incentive will get busted beyond repair, because it only means incentive for the pike and not for the minnows. Regarding the contribution of British colonizers to India, the countries that don’t have a history of colonization, like China and Russia for instance, have better roads, railways and industries built by natives themselves than the ones that have been through centuries of foreign occupation and colonization, such as the subcontinent. The worst thing the British colonizers did to the subcontinent was that they put in place an exploitative governance and administrative system that catered to the needs of the colonizers without being accountable to the colonized masses over whom it was imposed. It’s regrettable that despite having the trappings of freedom and democracy, India and Pakistan are still continuing with the same exploitative, traditional power structure that was bequeathed to the subcontinent by the British colonizers. The society is stratified along the class lines, most of South Asia’s ruling elites still have the attitude of foreign colonizers and the top-down bureaucratic system, Afsar Shahi Nizam, is one of the most corrupt and inefficient in the world. Regarding the technological progress, I do concede that the Western countries are too far ahead and even the Far Eastern nations, like Japan, South Korea and China, that attained their independence after India and Pakistan have become developed and prosperous nations, while South Asia has lagged behind. The way I see it, however, the failure of India and Pakistan in creating modern and egalitarian societies is primarily the failure of leadership. It’s a fact that the European culture evolved in a bottom-up manner during the Renaissance period, especially after the invention of the Gutenberg’s printing press when books and newspapers became cheap and within the reach of common man, but when we look at the technological and economic development of nations in the 20th and 21st centuries, that happened mostly in a top-down manner, particularly in Russia after the Bolshevik revolution in 1917 and in China after the Maoist revolution in 1949. Cultures take centuries to evolve and the basic driver is always the level of socioeconomic development of the masses, therefore the primary concern of the policymakers of the developing world should be to improve governance and invest in the infrastructure development and the technical education and vocational training of South Asia’s labor force. In the long run, technologically advanced and economically prosperous nations are more likely to bring about a cultural change, too. The basic trouble with the 21st century social reformers is that they have given up all hope for bringing about economic reforms; nobody talks about the nationalization of the modes of production and labor reforms anymore. Laissez-faire capitalism and consequent social stratification is taken for granted; thus, if reforming the economic system is out of question, the next best thing for the chattering classes to espouse is cultural reforms. It’s worth noting, however, that reforming culture is many times more difficult than reforming political and economic systems, which the neoliberals have already given up on because it appeared daunting and impossible to achieve. Truth be told, South Asia’s victim-blaming neoliberals lack any original insight into social and political phenomena, and they uncritically imitate the views of Orientalist academics. After the onset of the Industrial Revolution, when the Western societies were riddled with social disparity, the response of Western intellectuals was to come up with theories of economics, such as socialism, Fabianism and Marxism. The naive South Asian intelligentsia, on the other hand, is fixated on bringing about cultural reforms without the essential prerequisites of technological progress, socioeconomic development and investment on technical education and vocational training of the workforce. Finally, China is an interesting case study in regard to its history. Firstly, although it did fight a couple of Opium Wars with the British in the middle of the nineteenth century, the influence of Western imperialism generally remained confined to its coastal cities and it did not make inroads into inland areas. Secondly, China is ethno-linguistically and culturally homogeneous: more than 90% Chinese belong to the Han ethnic group and they speak various dialects of Mandarin, thus reducing the likelihood of discord and dissension in the Chinese society. And lastly, behind the “Iron Curtain” of international isolation beginning from the Maoist revolution in 1949 to China’s accession to the World Trade Organization (WTO) in 2001, China successfully built its manufacturing base by imparting vocational and technical education to its disciplined workforce and by building industrial and transport infrastructure. It didn’t allow any imports until 2001, but after joining the WTO, it opened up its import-export policy on a reciprocal basis; and since labor is much cheaper in China than in the Western countries, therefore it now has a comparative advantage over the Western capitalist bloc which China has exploited in its national interest. These three factors, along with the visionary leadership of Chairman Mao, Zhou Enlai and China’s vanguard socialist party collectively, have placed China on the path to progress and prosperity in the twenty-first century.